This new plug-in pole light base offers clean, fresh styling with a rugged stamped stainless steel cover. Perfect for saltwater applications and high-end boats. The round footprint is only 2-3/8" diameter. When closed, profile is only 3/8" high. 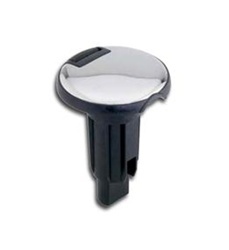 Molded inner cap seals water out of the socket when cover is closed. Inner socket contains a large drain hole to prevent clogging and contact failure. For use with all straight pole lights with a locking collar.